KoopaTV: Nintendo Laying Down The LAW On Fan Games! To my limited knowledge and limited research, none of these shut-down games were for-profit, and not even indirectly. They existed because a group of people or one person wanted to try their hand at being a budding game designer, using a familiar childhood franchise as their base. A common piece of advice game designers give to people who want to enter the gaming industry (besides “Don't enter the gaming industry.”) is to take existing works and make twists to them. Explore their systems. How they work. LEARN from what exists already. That's what these guys tried to do, except they also wanted to share what they've done to other people. Depriving people of that access to free fan-made content is making a lot of those people... mad! However, it doesn't matter only whether or not it's a profitable usage of a company's intellectual property. That can be a factor to determine Fair Use, but it's not the only one. To understand where Nintendo is coming from, here is a copy of the letter their lawyers sent the guy behind Pokémon Prism. 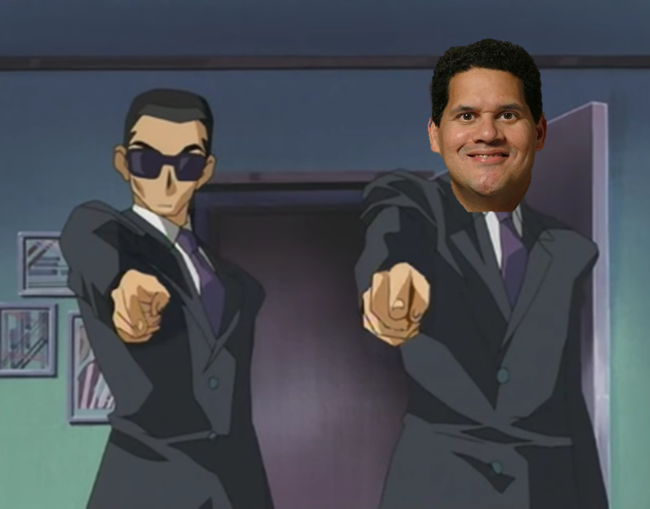 Reggie and an unnamed lawyer goon threatening fan game developers. I guess it boils down to this: All of these fan games are substitute goods for the original works. Because they're being distributed (and for free), they can be substituted for the commercial, copyrighted works Nintendo is putting out there. Why buy Pokémon Sun when you can download Pokémon Uranium for free and get a similar RPG experience? That's how the theory goes. They're not just minimally taking inspiration or assets from the franchises — they're basically making a sequel to them the same way Nintendo could, and distributing that. That, or the games do a poor job of substitution and are so bad they cause brand damage to Nintendo's intellectual property. There are games that originated like these games did, but evolved into their own entity — meaning they don't get trouble, even as commercial works. Freedom Planet is one of these games, originating as a Sonic the Hedgehog fan game. Obviously, that's preferable to copyright holders, and perhaps to creativity at large. However, I don't intend to bash the creators of Another Metroid 2 Remake and say they should've just made expys of all of the characters. That'd defeat the whole point of the project. I can't really conclude this article without discussing KoopaTV's own games, all of which take varying amounts of intellectual property from copyright holders (including Nintendo) to create a new (non-profit) work. I don't really want to do Nintendo's lawyers’ jobs for them by outlining exactly all of the kinds of infringement KoopaTV's own games commit, but I would argue everything on this site falls under Fair Use. I mean, we operate under the guise of parody, which is protected! ...Though Get a Gun, the credits song for Defend Anita Sarkeesian, is definitely Fair Use of the EarthBound music Smiles and Tears. I'm not going to sit here and condemn what these guys did when we do a similar thing here. The difference is that we're absolutely terrible at marketing the existence of our games to begin with, which I'm willing to admit to anyone who is willing to listen. All of these other games had a lot more media attention leading up to their releases, whether wanted or unwanted. Fortunately for our site's survival in a legal sense (and unfortunately in a readership base sense), there's just something about KoopaTV that repulses over websites from acknowledging our existence. So Nintendo doesn't know KoopaTV exists, right? ...Right? Keep it that way, okay? We dodged a bullet back in November; don't get us back into cross-fire! This article exists due to a request made on the designated Requests Page! Ludwig will be pissed off if this article of all articles has amazing search engine optimisation for some reason and then KoopaTV gets a cease-and-desist order. If brand damage is all it takes to get something shut down, then Nintendo could easily argue that almost every page on KoopaTV equates to brand damage. If you would like to help KoopaTV's game development, particularly with original asset creation that doesn't involve using copyrighted works without permission, then join KoopaTV's staff! Less than two weeks after this article was published, KoopaTV has fallen victim to a fake DMCA takedown notice that supposedly is from Nintendo! There's little point to Another Metroid 2 Remake existing if its official re-imagination does well. Is it best to shut down fan games, or to keep them up? The Wonderful 1237 at least shouldn't be targeted. It may have a similar name with an exclusive Wii U title, but at least it isn't vey obvious. The fan games that were taken down didn't even try to hide what they were copying. Yeah, it's not actively being a brand threat to a Nintendo game.